Kyani Premium Builder Pack - Buy Wholesale & Save! The Premium Builder Pack now comes with the new range of skin care - Kyani Fleuresse! This is the number one pack that includes all of the premium Kyani products that you can use for yourself, plus there are several additional premium products in both the bottle sizes and the individual packs that can be used as samples for potential customers. 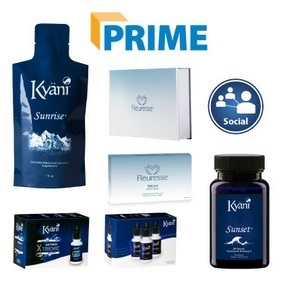 The Kyani Premium Builder Pack also includes an entire year of free Kyani Prime shipping. The prime shipping program will automatically renew at a reduced cost after the one year free membership (unless you cancel earlier). This is a feature that you can offer to your customers who sign up for monthly auto-ship deliveries that contain at least one prime Kyani product. You qualify for wholesale pricing when ordering prime products which will enable you to earn larger commissions. What Comes in the Premium Builder Pack? There is even more included in the Premium Builder Pack. This elite Kyani enrollment pack also comes with an entire year exclusive access to all of the business building tools available in the Kyani Digital Suite. These tools are the best tried-and-true way to help you grow your auto-ship and retail customer base which, in turn, increases your earned income. Plus, when you enroll with the Kyani Premium Builder Pack, you automatically earn hundreds of value points that also convert into income commissions. How Can You Buy the Kyani Premium Builder Pack? This pack is available in Australia for $1,395.00.